The story of two Himalayan sisters from Ohio. Since Peppers has been MIA for awhile, I figured that it would be nice to post some pictures of what she's been up to! All tucked in and ready for bed. Deciding to reorganize my nail polish stash. All curled up for a nap in her new t-shirt from her favorite Aunt Megan. Halloween 2011, as the Queen of Hearts. Using Daddy as a bed. Her second birthday trip to Petsmart to pick out her present. This year was a smaller cat tree and scratching post! Sorry for the lack of updates! Hopefully a pic dump was sufficient lol! We have a new addition! Peppers (formerly known as Bella... that name just didn't fit her personality!) was reunited with her sister from her actual litter last week. We welcomed her sister into our family after her owner passed away and after a short period of adjustment on all ends and nerves from the new kitty, she has settled right in and become another member in our little family. I was finally able to get a picture of the new addition, sitting with Peppers. Her name is Sugar, but we've found that she actually doesn't really respond to a name because she was called so many things. Jim's been calling her New Kid, so we'll see what nickname actually sticks. I thought Peppers was a tiny cat, but this one is even smaller. They're sisters from the same litter so I'm wondering if Mom was smaller too. I think I've figured out that she's a seal lynx point but I have trouble telling them apart if I can't see their faces. The only issue is that she's extremely matted, to the point that I'm just getting her shaved down next week. 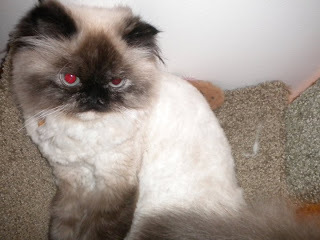 Her owner was really sick for a few months before he passed away and lost control of her grooming. Once she gets the mats off and grows out, I'm sure she'll be nice and fluffy. The non-matted parts of her are very soft and fluffy. I was going to try to get some of the mats off myself but there is no way I'd be able to get them all out without hurting her and I don't want to risk it with a cat that barely knows me. She is VERY affectionate though and became my shadow as soon as I brought her in. The introduction went much smoother than I expected. There's been some growling and hissing, but no physical confrontation. Peppers took one swipe at her for going near her bag of treats but that's been all. Progress has definitely been made because I caught them playing together after a few days and when I walked out to investigate, they were sitting together on the floor. We had some issues with getting acclimated to the litter box, but that has all been resolved. She's very slowly getting more comfortable with her surroundings. I have millions of cat toys around here and she's taken to a few of them. Peppers is a little iffy about sharing, but I'm quite proud of her because she could be handling this a lot worse. I'm hoping that by the end of the summer, they'll be running around together and causing chaos as a team. I'm so happy we decided to take her in because she's such a sweet girl and very complimentary to Peppers' bold personality. Hopefully I'll be able to keep making regular updates on them because their lives both just got a bit more interesting! Bella's been on a bit of a summer vacation from blogging, but she's back now! We're coming up on our one year Bella-versary, the anniversary of the day we brought her home! So what's she been up to this summer? She looks SO tiny without all that fur. She's small to begin with (She's never been over 6 pounds) but you can really see it without all the fur camouflaging her petite figure. So now that she has this short 'do, she can really get to get her paws dirty with some summer adventures! Jim and I have been doing a lot of fishing this year and we bring our catch home to clean and fillet. One day, we decided to let Bella see what we've been doing this whole time while she's stuck at home. She was very curious about the fishes we caught, but she didn't really want to eat them as much as she wanted to swat at the ones who were still moving around. 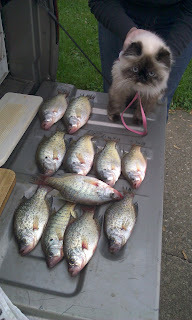 We tried to offer her some fresh fish, but apparently she turns her nose up at anything that doesn't come in a can. Recently, we decided to take a big risk with Bella. When we take her to picnics and the like, she doesn't have the luxury of air conditioner and she refuses to eat or drink anything if we aren't at home so I worry about her keeping cool and hydrated. While making a quick stop at Petsmart one day, we saw kiddie pools being sold for ten bucks, probably for dogs and puppies. Well, this kitty loves to be in water and has no problem getting a bath so we figured it might help keep her cool outside. We bought it and it was a great idea. She walked around in the water, laid down and enjoyed the sun while staying cool and probably stayed in there for a good half hour or so. 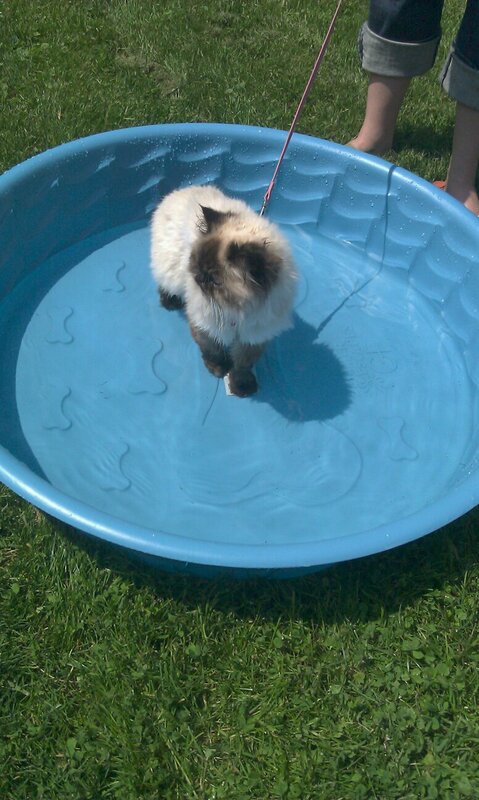 It was a great idea, except that when she wanted to get out, she didn't just hop out and go on her way... she jumped up on my (fully clothed) lap while I was dipping my feet in the water with her. Next time we try that, I'm wearing a swimsuit. As I said before, Bella is nuts for these treats. She has a pretty healthy diet and is a pretty fit kitty, so I don't feel too bad for spoiling her. We all deserve a treat sometimes! They're her guilty pleasure, although I don't think she feels too much guilt about it. Bella celebrated her first birthday on Valentine's Day! We took her to PetSmart a day early to let her pick out her presents and this is what she chose! She loves to climb so this was a perfect present. For some extra fun, we'll spray it with catnip spray (Bliss Mist, she's crazy about it) and she will scale the sides like a tree trunk. She loves to jump through the hole in the top and attack the feather attachment. She's very protective of her new condo too because if we pretend to scratch it like she does, she comes running to guard it and show us that it's hers. I love it because it gives her something to jump on that isn't the kitchen table or counters. She was so happy when we brought this home for her. 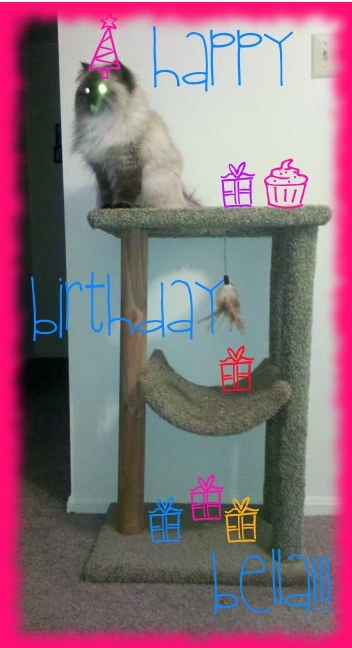 I'm glad she got an awesome birthday because she's an awesome kitty who deserves nothing less! 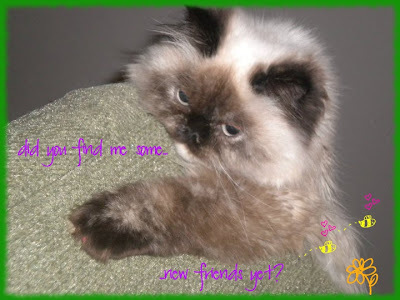 This is my blog, dedicated to my Himalayan cat Bella. Bella just celebrated her first birthday and it inspired me to start her a blog so she can share her adventures and cuteness with the world. Bella is extremely active and is what we call "The Anti-Cat". She defies all of the standard behavioral characteristics of your typical Persian or Himalayan cat. She loves to run, jump and climb. Her favorite place to relax is the highest surface she can jump to. She will even jump out of your arms and onto the top of an open door so she can either balance like a tight rope walker or drape herself across the length of the door and lounge. 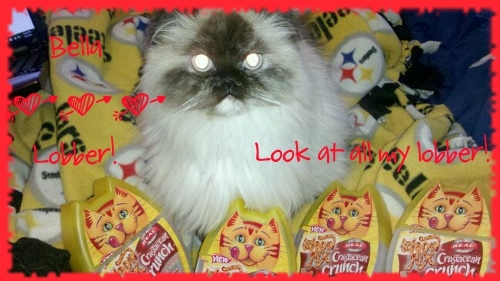 Bella is a VERY spoiled kitty. She has more toys than I can keep track of, but most of the time she is perfectly content to play with a straw wrapper or a crumpled piece of paper. We recently uncovered a pile of garbage underneath our bed where she has been stealing and hiding paper, wrappers, receipts and anything she could find. 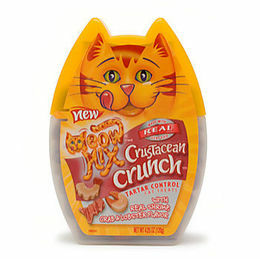 This kitty is not the one you see in the Fancy Feast commercials. She loves to get dirty. I think she's the messiest eater that I've ever owned. She also plays in her litter box after it's been cleaned out because she loves to dig around in the fresh litter. She hates being brushed so grooming can be a huge challenge. I've found that it's less stressful on both of us if we have a groomer shave her belly and rear end so it cuts down on having to brush out any mats that she may get there because brushing her belly is always a battle. Also, unlike most cats, Bella loves to take a bath. We usually bathe her once a month if she doesn't see the groomer. My favorite thing about her is that her gorgeous blue eyes! These big round eyes make for some great expressions that make you think you can read her mind. I spend a lot of times just watching and studying her because she is so fascinating. She goes anywhere that we can take her and she is the star of the show wherever she ends up. We've also noticed that she loves to watch television. We recently watched Cats 101 together and the WKC Dog Show. She will sit in front of the television on the floor and meow at it if she gets really interested. Other times, she will actually jump up to the TV stand to get a closer look. She is still very 'kitten-ish' and I hope that it sticks around for awhile. I love her energy and curiosity, even if it sometimes gets her in trouble. I take pictures of her almost everyday, so why not share them? I hope everybody enjoys my Bella as much as I do!